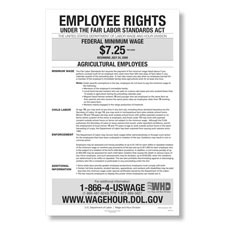 The Fair Labor Standards Act (FLSA) establishes minimum wage, overtime pay, recordkeeping, and youth employment standards affecting full-time and part-time workers in the private sector and in federal, state, and local governments. The FLSA requires employers to pay covered, nonexempt employees a minimum wage of not less than $7.25 per hour effective July 24, 2009. 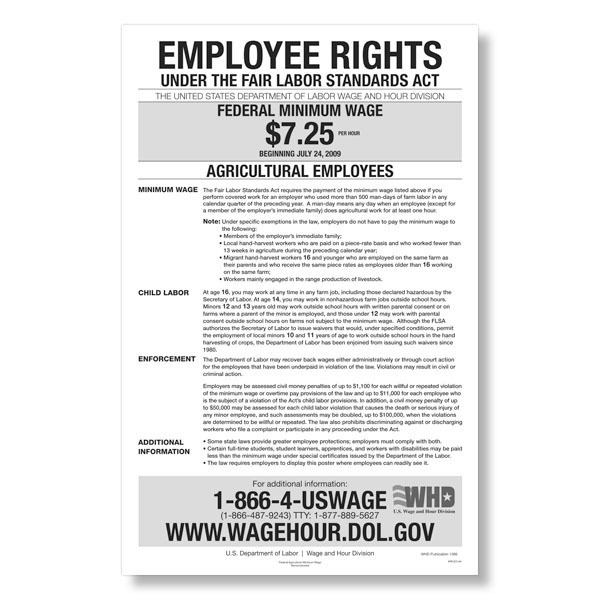 An employer who used more than 500 man-days of farm labor in any calendar quarter of the preceding must post, and keep posted, the Agricultural Minimum Wage Poster in a conspicuous place in all of their establishments. Laminated - 11" x 17"